For those in search of Korean comfort fare, look no further than Han Yang's stone-bowl bi bim bab ($10.95). Bulgogi, vegetables and shiitake are arranged in a circle on top of rice that turns crisp wherever it comes into contact with the pot. These ingredients are topped with a fried egg, and the whole mix is meant to be stirred at the table with ko chu jang (hot bean curd paste) stirred through for flavor. The end result is alternately sticky, chewy and crunchy with healthy greens and a touch of meat -- a snapshot of Korean cuisine in one bowl. If you're into more simple fare, the lures are combinations of kalbi with your choice of barbecue chicken, beef or meat jun. 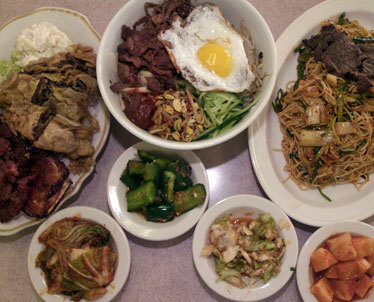 In the evening, diners are welcomed with about 10 panchan, varying from the usual kim chee to spicy fishcake, to accompany orders of yakiniku, tofu stew pots and the popular Han Yang Special (12.95), a plate featuring a thick cut of kalbi, barbecue chicken, bulgogi, a couple of pieces of fresh-made deep-fried mandoo and a single butterflied shrimp, in addition to the basics of cabbage, bean sprouts, rice and soup. There's plenty of panchan to enjoy at Han Yang. More aging hippie music comin' at ya as Commander Cody and His Lost Planet Airmen drop out of the ozone during their ongoing interisland tour to pay a visit to the Hawaiian Hut Friday night. Already an anomaly back in their heyday for their takes on classic boogie, swing and country, the band's lone top 40 hit came in 1972 with their version of "Hot Rod Lincoln." New Jersey blues guitarist Chaz DePaolo will be the opener. Tickets for the 9 p.m. show are $35 in advance and available at the Liquor Collection in Ward Warehouse, Hungry Ear in Kailua, Jelly's in Aiea, Good Guys Music on Kapahulu, Rainbow Books on University, Hawaii's Natural High in Waikiki and CR Imports on Mookaula, plus by phone at 545-2820 and online at hawaiisbesttickets.com. 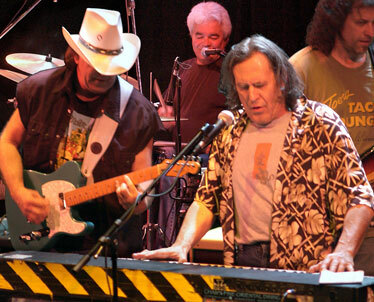 Tickets for the Commander Cody and His Lost Planet Airmen are $35. The time-travelin' musical act plays at 9 p.m. Friday at Hawaiian Hut. Call 545-2820 or visit hawaiisbesttickets.com. Burt Lum, former computer columnist for The Other Paper, is putting together a thing called the Unconferenz, described as "a grassroots tech/Internet gathering to foster sharing and interaction amongst its participants." The format is "Open Grid, Ignite Session, Internet+Tech, 45 minute sessions." Lum goes on to say that he doesn't want "talking heads -- we want participation, sharing and interaction. Product discussions are encouraged, especially if it is the creator, designer or principal innovator." Topics confirmed for "core" sessions include podcasting/vlogging/new media, digital storytelling, how to get business and government interested in Web 2.0 in Hawaii, and streaming video. It all happens from 8 a.m. to 3 p.m. Saturday at the Japan American Institute for Management Sciences, 6660 Hawaii Kai Drive. Attendance is limited, and cost is $20 in advance and $35 at the door, which includes a T-shirt and lunch. To signup, go to upcoming.yahoo.com/event/379564. More info can be found at http://unconferenz. pbwiki.com and Lum can be reached at 381-6877 or bytemarks@gmail.com. Once again, the Hawaii State Art Museum's "Live from the Lawn" event on Friday will feature some of the nominated artists vying for Best Hawaiian Album in this year's Grammy competition. From 5 to 9 p.m. on the museum's front lawn, artists to perform will include Cyril Pahinui ("He'eia"), Raiatea Helm ("Hawaiian Blossom") and Dennis Kamakahi, George Kahumoku Jr., Richard Ho'opi'i, Peter deAquino, Bobby Ingano, Garrett Probst, Owana Salazar and Sterling Seaton ("Treasures of Hawaiian Slack Key Guitar"). The event will be simulcast on KITV and on the Internet by Oceanic Time Warner Cable. Free to the public; lawn chairs, beach mats and picnic food will be allowed. Alcoholic beverages are prohibited. For more information, call 586-0900.